When you are shopping for an engagement ring, what you are looking for is not just another temporary piece of jewelry that sits in a box. Instead, you are seeking out a ring that really shows you are ready to make that promise of forever. Accordingly, you want to make sure the ring you buy for this occasion is really up for the task of lasting forever. When it comes to achieving this, you won’t find a better choice out there than a Forever One Moissanite stone. How Are Forever One Moissanite Gems Made? While you might be familiar with how carbon is used to create diamonds, Forever One Moissanite stones are cut from a different material. In fact, they are manufactured in a lab from silicon carbide, a substance that is often found in meteorites but not so common here on earth. Lighter than a typical diamond, these stones appear larger by carat weight, offer a more brilliant shine, and because of their manufacturing process are more affordable than your typical engagement stone. Of course, this is just the beginning of how much you can get out of one of these gems. If you are looking for a diamond ring, you likely already know the four C’s: carat, cut, color, and clarity. Beyond these four though, the Forever One Moissanite collection is offered with a fifth C in mind: confidence. Specifically, they offer the confidence in knowing that you get a top quality stone that passes through the most stringent inspection standards. To be sure, each gem includes a Certificate of Authenticity as well as a Limited Lifetime Warranty, giving you real peace of mind. So, what exactly sets these stones apart? First, each of the Forever One Moissanite collection stones falls within the D-E-F color spectrum, which means it is as white as you could ask for from an engagement ring. Second, each stone passes through strict quality control and only microscopic imperfections are considered acceptable for this range, which means you have a great clarity. This clarity shows through in the fire and brilliant shine that these rings offer forever. Third, these stones are available in many different cuts, giving you the choice to match your individual tastes. Finally, you can also choose from a variety of carat sizes and since they weigh less than diamonds, you can enjoy a larger stone with the same carat size. Once you account for all of these factors, it is important that you also consider the finer points of the buying process. For instance, you might already know you are interested in a radiant cut ring, but how else would you like to complement it? Should it placed within a gold band, or white gold? 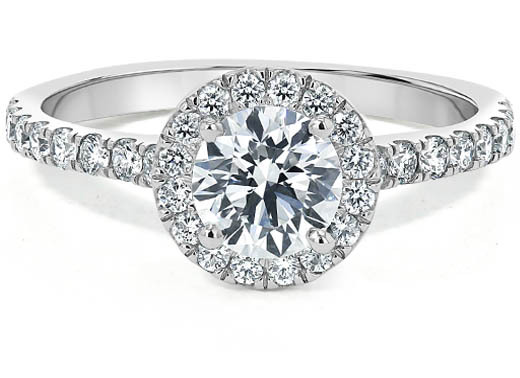 Are you better looking for a solitaire ring, or one that has many other, smaller gems? Ultimately, these questions can only be answered by you and the person you are buying for. Either way, a Forever One moissanite ring is definitely a great way to express your desire for forever and provides a ring that will last throughout that time.